What can I tell you? I thought I didn't want to go there! I was wrong. I loved Las Vegas, what a great experience. There's just so much happening I didn't know where to look. Wonderful shows to see - we were enraptured by O - Cirque du Soleil at the Bellagio. Shopping malls that just went on and on and if you got tired you could get a gondola ride to relax or take a seat to try your luck at the slot machines, or a drink from any of the numerous bars. Day or night, there was always something happening. There seems to be Casinos everywhere and this is the first time I've had to walk through one to get to the Hotel reception! I was really excited to walk into a shop (called Gap) and purchase a pair of jeans that fitted perfectly, no alteration required (another first) and a shirt and another shirt - do I need to say more? 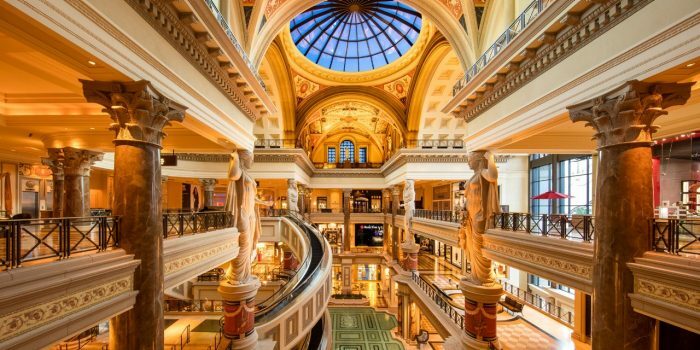 The Forum shops adjacent to Caesars Palace just take your breath away. The statues, beautiful tiles, curved escalator, incredible decoration you just can't take it all in and it seems to just go on and on! Needless to say, Las Vegas takes on a whole new vitality at night. The beautiful fountains at the Bellagio, choreographed to music, the volcano at the Mirage that goes off every half hour or so this place is about excess!